A lot has happened since I left my job as Pacifica Radio’s Executive Director at the end of 2007. Almost a decade after she was abruptly fired former KPFA General Manager Nicole Sawaya returned as my replacement with enthusiastic support from the Board and community – but resigned twice over the next year. As the network approached its 60th anniversary it faced the most serious organizational and financial crisis in years. On-air fund drives, which bring in over 80 percent of the network’s income, weren’t meeting their goals, most stations had meager cash reserves, and WBAI was a half a million behind its target and mired in an internal power struggle that had been building for several years. The problems intensified further when Sawaya resigned and corporate counsel Dan Siegel stepped in. “He applied intimidation regarding the still-pending certification of KPFA results,” Peters claimed, “telling me that I would be fired if I did not do so promptly. The problem was that criteria for certification had not been met due to irregularities in the campaign.” Peters came to believe that Siegel was attempting to control the outcome of the vote. On March 13, 2008, as Peters was about to fly to New York for the WBAI vote count he received a message from Chief Financial Officer Lonnie Hicks. The word was that Siegel didn’t want him counting votes in New York. Furthermore, he was being fired. A few days later, according to Peters’ account, Siegel entered his home without notice and startled his wife. “His intent was to confiscate election equipment and materials,” Peters wrote. “Siegel had apparently been drinking, and sat in a rented SUV flashing his headlights into our bedroom. Marilyn called the police to stop the harassment. We seriously considered pressing trespass and assault charges, but felt any publicity about the incident would not look good for the Pacifica Foundation.” Nevertheless, after the elections a lawsuit was filed by one faction at WBAI against the network and its representatives. One of her first big decisions, made with Hicks’ agreement, was to cut the budget for Free Speech Radio News by 25 percent. What seemed to shock some people wasn’t so much the cutback (about $11,000 per month) but the fact that it was done without prior discussion. Sawaya explained that the financial crunch required strong and immediate action. The Board decided to let it stand. The next surprises came in July, just as budgets for the next fiscal year were being developed. The National Board had voted to convene in person that month, but the national office didn’t follow up and the meeting had to be cancelled. Afterward, without explanation, Hicks disappeared from work. No announcement was issued, but news leaked out that he was on “paid leave to deal with family matters.” Later, rumors circulated that an investigation of his activities was being pursued – and also that he might sue. Sawaya meanwhile assumed responsibility for budget development, pushing for staff reductions and other budget cuts. In the end, she left first, while Hicks returned to work in late 2008. He was ultimately terminated in early 2009, and replaced by an old nemesis, former National Finance Committee Chair LaVarn Williams. As predicted, he filed a lawsuit, alleging that he was dismissed because he was African American and a whistleblower. Clearly, Hicks had a sense of irony, considering his frequent warnings about escalating legal costs, the fact that a majority of Pacifica’s National Board and staff – including his replacement – were people of color, and that he fought as hard as anyone to hold back information from the board and membership when he was in control. Sawaya announced her second resignation in early August 2008, but asked those who knew not to say anything for a month. At meetings, she meanwhile tried to convince the Board and National Finance Committee that Pacifica should act like a network and “centralize” various functions, especially accounting and reporting. Directors listened but nothing changed. As the national political conventions approached she turned her attention to Pacifica’s coverage. A radio journalist, Sawaya considered it a high priority. Still, people were surprised by her decision to leave the national office and personally cover the presidential race at a time when the main management issue was resolving its financial crisis. What they didn’t know was that she had already resigned. Before she left for Denver, another confrontation intensified the situation. A volunteer programmer, allegedly “banned” from KPFA in Berkeley, showed up unexpectedly. The General Manager wasn’t around, but the Business Manager felt that something needed to be done. Calling the National Office next door, she asked for advice from the new Human Resources Director, Dominga Estrada, who advised her to call the police. According to witnesses, when the cops arrived excessive force was used. Sawaya was there and attempted to block videotaping of the event. This deepened the existing divide at the station. Management defended its decision but said it wasn’t responsible for the overreaction of the police. Dozens of volunteers, and some on the staff, saw it as another example of a management out of step with Pacifica’s values and mission. A letter of no confidence in GM Lemlem Rijio was signed by dozens of people. Soon afterward HR director Estrada left for a new job elsewhere and the National Board began to openly discuss what was called a “national office collapse.” The term actually referred to one of several options for how to address the overall problems. One alternative was to struggle on as is, a decision that would create a large budget deficit. Another was to cut some national positions and the salaries of others. The third and most radical option was to lay off almost everyone, retaining only enough staff to pay the bills and keep governance and the national office functioning. The Board also had to decide what to do about the leadership vacuum. Some hoped to quickly recruit a new Executive Director. But the process would take months, and proposals to re-expand the CFO’s authority and apply strict performance standards to managers were likely to get in the way. Even if a new chief executive could be found – and the Board overcame its divisions – there were elephants in the room. Pacifica’s leaders were far from agreement on how to resolve its financial crisis, and, even more difficult, restructure its programming and management to reverse the long-term decline in listenership and income. By early 2009, as blogs and discussion forums speculated about receivership, bankruptcy, and breaking up the network, the balance of power shifted again. In New York and on the national board, the controversial Justice and Unity Coalition lost control. A new national chair, Grace Aaron of Los Angeles, stepped in as Interim ED. As the crisis deepened, she took dramatic action. WBAI was facing eviction. It was $128,000 behind on the rent for its Wall Street office and studio space by April, and owed another $75,000 in back payments for its coveted transmitter atop the Empire State Building. It was losing at least $500,000 a year, required repeated short-term bailouts, and owed the national office almost $1 million in back payments for central services. WBAI had weathered storms and struggles before. But this time the troubles not only could bring down the station but also threaten the future of Pacifica itself. To reduce the rent, Tony Riddle, the station’s fifth General Manager in seven years, renegotiated a long-term lease with Silverstein Properties – without getting Aaron’s approval. Under the new terms, WBAI had to pay $60,000 in May, another $75,000 in June, and $45,000 by July 25. If the station or Pacifica missed a payment, the consequence would be immediate eviction. It turned out to be one of Riddle’s last acts as GM. In early May, Aaron removed him, but created a new “at home” job for Riddle as National Development Director. It was apparently a consolation prize for not making a stink. The new CFO, LaVarn Williams, was appointed Acting GM of the station. Almost immediately, Program Director Bernard White was removed. Aaron had already ordered the locks changed on the transmitter site. While some WBAI boosters cheered the changes as long overdue, others took to the streets, decrying a racist world view among opportunistic liberals. In June, Aaron removed another GM, Ron Pinchback of WPFW in Washington, DC. The station had also lost listeners and fallen short on fundraising in recent years. Yet critics saw racial motives: like White and Hicks, Pinchback was African-American, suggesting to some that the changes were really a purge of top Black managers. The fact that most replacements were also Black was overlooked. “WBAI was predominantly white in the 1960s and 1970s,” noted JUC leader Lederer. “And there has always been a rear guard of white listeners and programmers who want to go back.” JUC members and other Bernard White backers threatened to boycott and possibly sue unless this latest “national coup” was reversed. The station’s “race” war wasn’t over yet. When Amy Goodman expressed “dismay” about White’s removal in a letter to Pacifica management, Williams replied that he and previous GMs were responsible for a “failure model” that jeopardized both “your program and the whole foundation.” Despite the popularity of Democracy Now!, Amy’s influence had become limited over the years, mainly governed by a mutually lucrative contract to air the show and assist with fundraising. Thus, barring a successful lawsuit, which could take years to resolve, or an LSB election that returned the JUC to power, Bernard White had seen his final days at Pacifica. By 2010, Pacifica finally settled on a new Executive Director, Florida feminist radio host Arlene Engelhardt. The intensity of conflict was down a bit, but revenues from on-air fundraising continued to decline. KPFA’s GM Rijio was forced out and only KPFT in Houston had permanent management. 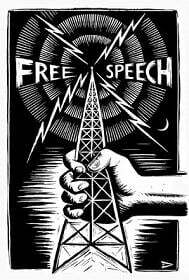 When rumors fly through Planet Pacifica or attacks get especially nasty, people often blame provocateurs and charge that the government is out to get radio’s voice of the people. There is some basis for this suspicion. The FBI had Pacifica in its sights as early as 1958, and took a special interest in 1962 when former Special Agent Jack Levine gave KPFA an interview. Levine exposed the Bureau as a threat to democracy and a tool of J. Edgar Hoover, its vain and obsessed director. According to Mathew Lasar, who reviewed Freedom of Information Act files, the Bureau poked, prodded, and harassed the organization for years, even planting agents disguised as private citizens. In recent times, however, charges of counter-intelligence operations directed against the organization have been speculative at best, and occasionally excursions into free-range paranoia. As Executive Director, I was frequently asked to investigate such suspicions but found no solid evidence of a government operation. And even if a disinformation campaign was being pursued, it would be overkill. The Pacifica community is capable of destabilizing itself without a federal assist. Outside forces aren’t responsible for the bylaws or listener activist distrust of staff, the slow response to the digital age, disputes about the mission, programming gridlock, financial decline, or misbehavior by board members and volunteers. Part of the problem is the version of democracy put in place in 2002. At this point, the five stations had about a million regular listeners (declining since then). Of this total, about 10 percent make financial or volunteer contributions, qualifying them to participate in local elections. Of that total, little more than 10 percent actually return ballots in the elections. In recent years it has sometimes been difficult to reach that bylaw-mandated threshold. Due to instant runoff voting, it takes at most about 300 votes for someone to be elected to a station board. In other words, Local Station Board members draw their right to govern from less than one percent of the listeners. And in order to win, candidates often resort to negative appeals, especially charges that the process is corrupt and Pacifica isn’t democratic enough. In general, the elections have tended to perpetuate an atmosphere of confrontation and suspicion. Board meetings also pose problems. They frequently feature rude outbursts and other disrespectful behavior. Roberts Rules are often abused, becoming weapons of obstruction rather than tools to promote rational discussion. Members use e-mails to spread rumors and promote debates of marginal relevance. In many cases, factional alliances manipulate the rules. Productivity suffers and questionable behavior opens the organization to legal liability. All this has had the effect of alienating potential supporters or future board members. Touring the stations back in 2006, I repeatedly asked whether Pacifica was trying to operate a radio network or create a government. The reason was that it looked like the latter. Some even wanted quasi-judicial bodies – like the Committee to Investigate Allegations of Racism and Sexism formed in 2006 – and the equivalent of a Freedom of Information Act, as if Pacific was a National Security State. Anyone who questioned the “bold experiment” was considered out of step, possibly even a reactionary. More than three years after I left, despite financial crisis, major staff turnover and a forceful exercise of executive power, progress remains elusive. Change is in the air, but the outcome is uncertain. Another round of contentious Board elections is underway, and whatever the results, they will likely either slow down the pace or again alter the direction. Greg Guma is an author, editor, and former CEO of the Pacifica Radio Network. His books include The People’s Republic: Vermont and the Sanders Revolution, Uneasy Empire: Repression, Globalization, and What We Can Do, and Passport to Freedom: A Guide for World Citizens. He is currently completing a book on progressive politics over the last 40 years and follows current events on his blog, Maverick Media(http://muckraker-gg.blogspot.com).